Boston is launching a pilot program that could let car-sharing services, such as Zipcar, use 200 of the city’s public spaces. Officials in Mayor Martin J. Walsh’s office declined to disclose the exact number of spaces affected by the program until they issue a request for proposals on Monday. But they confirmed that the number initially would equal two-tenths of 1 percent of all the city’s public spaces. With more than 100,000 in Boston, that means roughly 200 spaces. This sort of thing happens in other cities: Enterprise and Zipcar already use public spots in cities such as Baltimore and San Francisco. And here in Massachusetts, car-sharing companies use a limited number of municipal spots in Cambridge and Brookline. But until now, those cars were not competing for hard-to-score public spaces in Boston. Betsy Hall got rid of her car four years ago and regularly uses Zipcars parked at the building where she lives in the South End. She could see the city’s effort working with spaces in municipal lots. But taking away street spaces reserved for residents? The one-year pilot program could be broadened if successful. City officials expect to pick winners by early summer, and public hearings will be held. The bids are expected to bring in new revenue for the city. But City Hall officials say the primary goal is to encourage more people to ditch their cars, eventually opening up more spaces. In weighing the bids, the Walsh administration will consider geographic factors, in part to put some of the designated spaces in places without good rapid transit options. 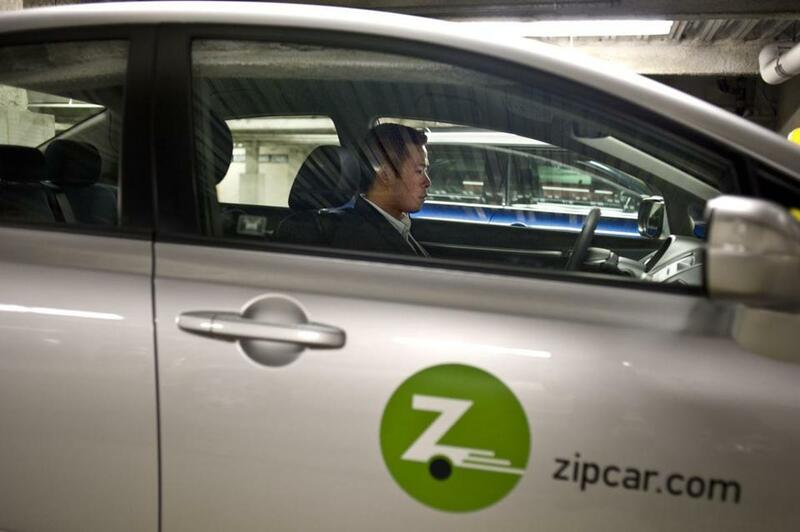 Boston-based Zipcar, a subsidiary of Avis Budget Group, and Enterprise Holdings are likely to bid for the designated spaces as a way to expand their substantial local operations. Zipcar, for example, already has approximately 1,200 vehicles in and around the city. Nearly all of those cars are now parked on private property. But Zipcar executives are also well versed in Boston parking politics. They say they’re in no rush to take over spots in parking-starved neighborhoods such as South Boston, and would instead start with spaces in less congested areas, such as Roxbury, Dorchester or East Boston. The second part of the program would attract a new kind of car-sharing concept for Boston: allowing drivers to pick up and drop off cars almost anywhere in the city. Fast-growing Car2Go, the most popular of these free-floating services in other US cities, would not confirm whether it would bid, but said it is interested in coming to Boston. Car2Go’s model is typical of how such services work: The company puts a set number of cars within a designated “home area,” often 50 square miles. These cars are the small Smart ForTwo cars manufactured by Car2Go’s parent company, Daimler. Members use a mobile app to find the closest Smart car, pay by the minute, and then park in any available spot within the home area. They don’t have to pay for metered spaces or observe residential restrictions. These cars can’t sit in one spot forever: Car2Go typically needs to move cars that remain in one place for too long. Boston officials said they expect the time limit here would be 24 hours. Car2Go’s expansion hasn’t come without headaches. Residents of Torrance, Calif., griped last year about the influx of these cars on residential streets, for example, and people in Calgary, Alberta, complained that the cars occupied too many downtown spots. Users have taken to the Yelp website to complain about technical glitches and customer service issues. Car2Go also retreated from the UK market last year after its service didn’t prove popular enough there. Bostonians may cringe at the thought of sharing their spots. But some say the pluses outweigh the disadvantages.